Nina’s Hacker Leaks Boyfriend Chats & Photos | Rita Dominic’s Phone Number. BBNaija’s Nina is having a very bad time now after she recently had her Instagram account hacked by an unknown blackmailer. The Hacker has released damning details, private chats, photos and many more unbelievable facts about Nina. At first, the hacker demanded N800,000 and threatened to release unsafe photos of the 22-year-old beautypreneur if she failed to comply. Her refusal to respond to his threats is most likely already causing her valuable relationships as he has released chats of the former reality TV star that suggest she’s not as loyal to her sponsors and mentors as she should be. 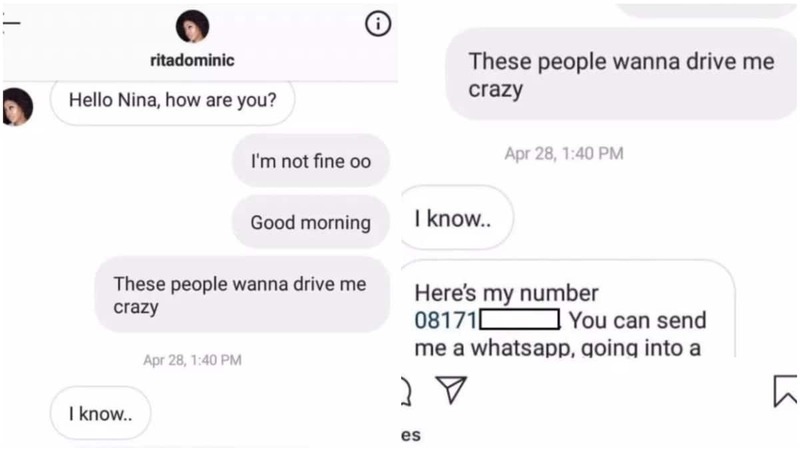 Just recently, the hacker went on to another level, where he released chats between Nina and famous actress, Rita Dominic. See chat below showing Rita Dominic’s phone number. He also released the identity of her new boyfriend and went on to threaten to release more damning things. The unidentified hacker has also managed to direct traffic to his personal page and has amassed over 12,000 followers since he started releasing personal conversations between Nina and other celebrities. With the aim of completing tarnishing Nina’s image and destroying her personal relationship, he has shared the phone number of actress, Rita Dominic and fans are having a filled day.